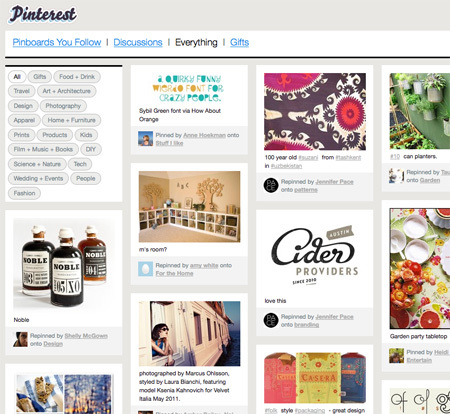 If you do a lot of online research and bookmarking, consider adding Pinterest to your arsenal. 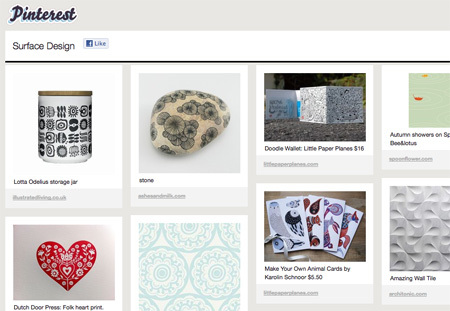 This is the visual bookmarking tool we have been waiting for. I think the folks at Pinterest are underestimating its wonderful potential by calling it “a virtual pinboard — a place where you can create collections of things you love”. I would add that it’s also a powerful research tool for anyone who’s wished they could include images with their online bookmarks. Pinterest can also be used for creating project mood boards as you develop design concepts for personal or collaborative brainstorming. I do that here, for a packaging project (screenshot below), and I’m curious to see how others are doing it. To share mood boards with clients or partners, I’d be interested in paying to customize a particular Pinterest board for, say, 3-6 months, with the option to display my name or logo at the top. Making use of Pinterest requires installing a bookmarklet on your browser (there are notes for Firefox, Safari, Chrome and IE, as well as Safari on iPhone and iPad). When you spot an image on the web that you want to remember, “Pin it,” choose the image you want displayed, and save it with a few comments to a category (they call it a Board). The Pinterest guys regularly entreat users to make pretty boards (“‘follow’ collections created by people with great taste.”), and it’s actually wonderfully easy to make them so. Because of that focus, some of my rather un-pretty research boards make me feel vaguely criminal. One of my big Next Feature requests is for an option to pin an item to multiple boards at once. I find myself pinning and re-pinning images that I’d like to find under a few different categories. And finally, I’d like to propose a partnership: Would Chad Hurley and Steve Chen (the new owners of Delicious.com) and Paul, Yash, Marty, Sahil, Enid and Ben of Pinterest consider getting together to make me some Bookmarking Heaven? How about offering a Pinterest widget to display Boards and/or Individual Pinterests in the right column of my Delicous page? It would also be very, very nice to simply display individual Pinterests in my list of recent bookmarks. PS: It took me so long to finish this post that Pinterest has since revised their header graphic. Very lovely! I’m too lazy to go back and update the blog images, so head over to their site to see it for yourself.